eligible to apply for this CG Forest Guard, Game Guard Jobs. Last date for submission of applications for this CG Forest Guards is 04-09-2018 till 05:00 Pm to their own district Forest Offices of Range Forest Officer. Application form is available for download @www.cgforest.com Range wise vacancy details are given below. For Bilaspur Region Forest Guard/Game Guard jobs application form to be submitted online only. Application to Selection for these Vanrakshak/Game Guard vacancies recruitment will be conducted through Physical Efficiency tests PET, PST-Physical Standard Test, Certificate Scrutiny or verification and medical tests. 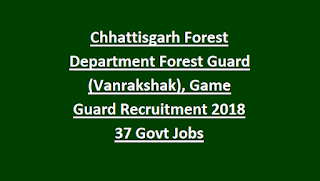 For more details regarding Chhattisgarh State Forest Guard, Game Guard Jobs Recruitment 2018 please see the details provided below. Applications will be accepted in own district Forest Range Officer Office. As on 01-January-2018 age limits for general candidates is 18-35 years. HSC or 10+2 on intermediate qualification is required. Selection this Chhattisgarh Forest Guard recruitment will be held based on Written Test and/or Physical Efficiency Test and Physical standards test. Weight: Based on candidates height weight will be calculated. 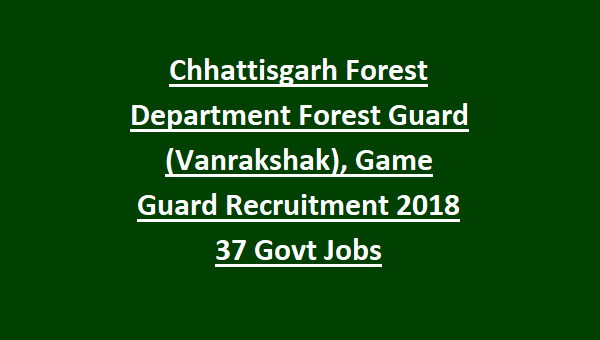 Interested, HSC qualified and Physically fit Male and Female candidates can apply for this CG Forest Vanrakshak, Game Guard Vacancies. Application form is available for download @www.cgforest.com. Candidates have to submit the filled application form along with all necessary documents to nearby Forest Range Officer before the closing date based on Forest Circle.